Are Spark fibre plans overdimensioned? Forums › Spark New Zealand › Are Spark fibre plans overdimensioned? I'm just curious on whether Spark's plans are overprovisioned like BigPipe, or is it just the standard profile. If not, will they be in the future? can i ask why it it really matters? I would have thought this answers your questions, or more specifically this graph. i think the op is asking if spark use the older regulated chorus plans which are provisioned at l2 to the exact speed (meaning the consumer sees speedtest results lower than the advertised speeds) or the newer plans that are over provisioned to ensure the consumer sees the speed they are paying for. For the 100/20, or the 200/anything plans, they are the new ones. Not sure about the 100/50 since that exists in both the new and old plan structure. The answer is that it is a mix. If you're buying any new plans now, it will be the higher speed profile. The 30/10 is a bit of a special case. We buy the higher speed input, but we restrict it down to the 30/10 L2 speed - so it essentially looks like we're buying the lower speed input. There are various reasons as to why that I'm not going to go into. Not that happy about it, but it is the way it is. It won't be forever. If anyone on 30/10 is feeling desperate for a tiny bit more speed, then PM me and I may be able to tweak this on a line by line basis. No guarantees. cbrpilot: The answer is that it is a mix. If you're buying any new plans now, it will be the higher speed profile. So if if we upgrade from 30/10 to say 200/20 or 100/20, we would be put on the newer overdimensioned profiles or is it only available to new costumers who initially ordered the higher speed plans. We put the upgrade order through over a week ago, hopefully it gets sorted before the end of this week. 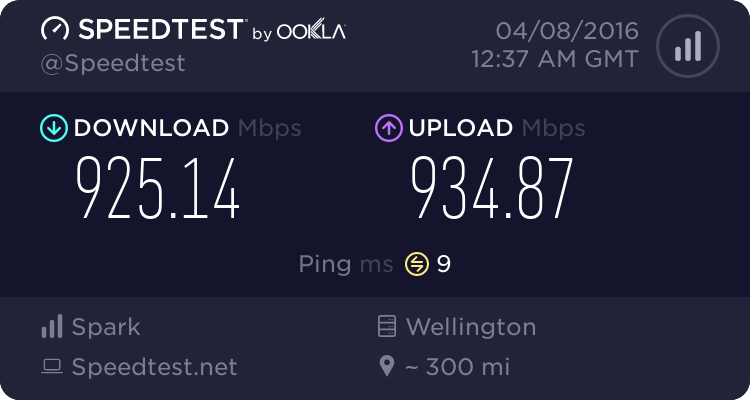 We had a new 100 down Spark connection regularly speed tests (not 100% accurate i know) 102mbps. So I'd say yes. Yes 200/20 and 100/20 are "overdimensioned".